This shop is named for the late John Gardner, who was renowned for reviving interest in traditional wooden boats. He taught here from 1970 to 1995. Replicas of historically significant small craft are built In this shop by the staff both for use on the Mystic River and to demonstrate boatbuilding techniques. Recent examples include Pete Culler’s design for a “Good Little Skiff,” a whaleboat, Chamberlain skiffs and catboats from designs by the Crosbys of Cape Cod, and Gil Smith of Long Island. The purpose of the Small Boat Shop is to study, teach and encourage the construction and use of traditional small sailing and rowing boats. This is accomplished through research into small craft construction, the publication of articles and books, the sale of lines plans and construction drawings and boatbuilding classes held at Mystic Seaport. 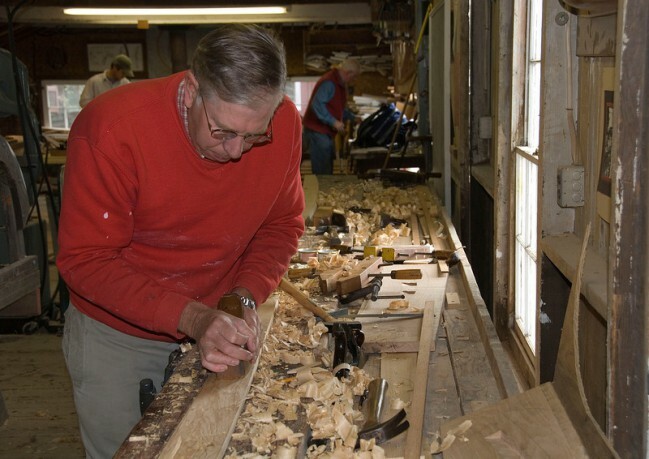 The annual Small Craft Workshop, a weekend gathering of traditional boat owners, professional and amateur boatbuilders and small boat enthusiasts, allows participants to compare boats and ideas and to learn more about wooden boat construction and use. The building was originally a workshop located along the river just south of the Museum’s Preservation Shipyard. It was moved to this site in 1958.